The original plan for this trip was to sail from Tollesbury saltings to the Scilly Isles, popping into Fowey on the way to nip across to the Eden Project. After a potter about round the islands, head off back to either Newquay or Falmouth where Miriam, one of the crew, would jump ship in order to get back to an appointment. Then Alan and I would head back to Tollesbury, on the understanding that I would have to jump ship at some point in order to get a flight across to the Brussels Jazz Marathon. Alas, as with all great plans, this wasn't to be. The reasons for the departure from plan will unwind as you read on. Bad omens appeared soon after we started the journey on the early morning tide, heading down the Orwell estuary on a cold, wet, grey dawn. We were heading back to Tollesbury, the saltings where Alan's boat, Kiitaja, was normally moored, to pick up Miriam Addy, the third crew member. Passing down the Wallet off Walton-on-the-Naze, we received a May-Day from a fishing boat, which we could not see in the mist. The message was broken and muffled but the panic words "engine fire" were mentioned. Once we had the vessel's position from its skipper, we hastened back to the coordinates. We soon got to the vessel and asked the shaken crew if they needed assistance. The fire was by now out but the craft had no engine power. Within the space of ten minutes, three lifeboats turned up, and at the skipper's request, one took the vessel in tow to Titchmarsh marina. It was really heart warming to find that our coast guards are continuously on the ball and could summon ample and prompt help so quickly. We resumed our journey to Tollesbury, but Alan's concern now was that due to the May-Day diversion, we may miss the window of opportunity to berth at the saltings to collect Miriam. Access to the saltings is normally about an hour each side of high tide, and missing the current tide would mean a twelve hour delay. This became even more complicated when we received a radio call from Miriam, who was at the time sailing back to Tollesbury with her fianc�, stating that their engine, which had been working intermittently, had now died altogether. We caught up with them and gave them a tow to their berth. After we had dropped Miriam's boat off at her berth, Alan quickly headed into his berth for the collection of Miriam plus the extra provisions she was bringing. The tide was by now ebbing, and time was of the essence. Just as Kiitaja was entering its berth, a sudden gust of wind pushed her away from the staging, ripping out a bow mooring post and causing a stern line to become entangled around the prop, stopping the engine dead. We were now going nowhere until this was untangled; some brave soul had to get into the muddy water and under the stern to untangle the rope. Making matters worse, with the tide now on the turn, there wasn't much water between the stern and the thick stinking mud that forms the bed of the saltings. Never having experienced such pleasures of swimming in mud, I volunteered to venture below into the murky waters. I stripped down to swimming shorts and waded into the icy cold muddy water. The only way to access the prop was to get completely under the water, and since visibility was almost nil, the rope had to be untangled by feel. It took a few attempts, but the mission was eventually completed. We just managed to slip the berth in what must have been centimeters of water to spare. The voyage resumed, and it already seemed to have been a long day. As we headed down to North Foreland the wind picked up enabling a good close-haul sail. Our journey was interrupted by the mizzen sail falling down; the halyard had snapped, so we continued our sail under genoa and main. The wind direction was unfavourably on the nose, so we had to resort to engine power, and with strong winds forecast, we decided to seek shelter in Ramsgate. After a little bobbing about outside Ramsgate waiting for a ferry to enter the harbour, we put in around 01:00, found a spare mooring on a jetty, and settled down for the night. We sheltered for two days in the marina, during which time we took the opportunity to make some repairs. We purchased new rope, and I volunteered to climb up the mast using a Heath Robinson system of pulleys, and thread the new halyard down inside the mast. The operation was a success. At dawn on the second morning, the Grand Turk, a three-masted sixth-rate frigate, slipped into the marina. 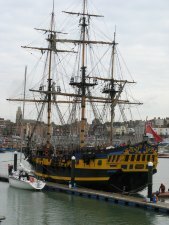 This magnificent ship is an authentic replica of the frigate HMS Blandford built in 1741. She was laid down in Marmaris, Turkey in 1996 primarily as an action vehicle for the international TV and film industry. She is familiar as a stand in for HMS Indefatigable in the TV series Hornblower, although the historical Indefatigable was a larger ship. She has also served in the same TV series as the French ship Papillon. On 28 June 2005 she stood in for HMS Victory, Nelson's flagship at the International Fleet Review off Portsmouth (GB), commemorating the 200th anniversary of the Battle of Trafalgar. Nowadays the tall ship is used mainly in sailing events, for corporate or private charter, and for receptions in its spacious saloon or on its deck. With Ramsgate becoming a little boring, time pressing on, and unreliable weather forecasts predicting an easing of ferocity, we decided to break out just after midday and make a run for it further down the coast. We soon had our knuckles wrapped by the elements; the wind was getting stronger and the seas were becoming decidedly rough. 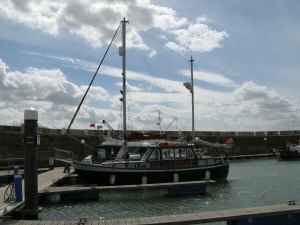 Shelter was sought in Dover marina. Weaving a way in through the constant ferry traffic whilst bouncing about on turbulent seas can best be described as an interesting experience. We found that by pure chance we were moored next to the Nancy Blackett. 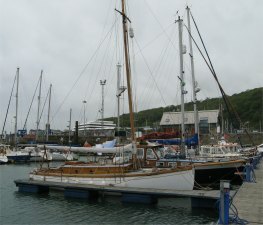 Nancy Blackett is one of the boats once owned by Arthur Ransome, author of the "Swallows and Amazons" books, and appears in "We Didn't Mean to Go to Sea". Recently rescued and restored, Nancy Blackett is now preserved and maintained by the Nancy Blackett Trust, and is regularly on show at maritime festivals, as well as sailing hundreds of miles each year, crewed by Trust members. The weather was now deteriorating which was rather concerning. We came across other crews who were also concerned about the worsening conditions. One crew who were trying to get their boat across to Ireland had decided to leave their boat in Dover and fly there instead. Another crew hoping to reach Scotland also decided to opt for an early alternate transport mode. Since we were going to be cooped up in Dover for a while with winds Force 6-7, occasionally gusting to 8, we decided to make the most of it. Alan had mentioned to me that one of the windscreen wiper motors was throwing out sparks when it was switched on. I stripped it down, cleaned out the commutator segments, reassembled it, and that cured the problem. However, all the mechanisms were seizing up on the external side of the screen, so we dismantled all the exterior parts, cleaned them and applied liberal coatings of WD40 and oil, and they all seemed to function well after reassembly. We also used this dead time to improve our culinary skills; I quite enjoy cooking for a group of people. Cooking on board a boat presents its own challenges. When at sea, particularly if it is rough, it may end up as an exercise in trying to open cans whilst jamming oneself on the floor in a kneeling position. Such joys are increased multifold when trying to extract pots and pans out of the small locker under the stove; everything spills out. I have a problem trying to cook below decks in rough weather since lack of a horizon to focus on can make me seasick. However, in calmer waters, cooking on board can be a pleasurable experience. Since Miriam was vegetarian, the majority of meals had that bias, though she was a sport and occasionally cooked us a non-vegetarian meal. Miriam and I both enjoyed cooking; Alan definitely sees cooking as a chore, though he will occasionally indulge. I can imagine him on one of his solo sails pulling out cans on a lucky dip basis and creating a magnificent concoction. I did try and instill a sense of healthy eating on ship, and earned the reputation as the "health police". Alan was keeping busy running his software business from the wheelhouse. He was fortunately, or unfortunately, a lynch pin for a few companies' systems software, and his services and advice were in constant demand. Miriam, who was involved in an organisation supplying teaching services to Burma, was also constantly emailing to oil the wheels of the organisation. I just oiled anything that moved. Exploring the town was a short lived experience, though the museum is worth a visit. Miriam was not impressed with the layout of the town, and imparted me with some of her professional knowledge on the subject by giving me a lecture on urban design. How can anyone get enthusiastic about such stuff; Miriam certainly was. The castle is a different story. Miriam and I killed the best part of a day exploring the castle and undertaking a guided tour of the military tunnels. The Romans built two lighthouses here, one of which is still standing. 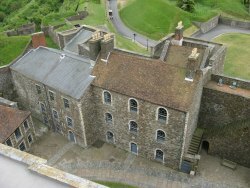 It was during the reign of Henry II that the castle began to take recognisable shape, and modifications were still being added by Henry VIII. More modifications were made during the Napoleonic Wars. 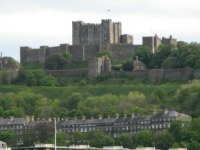 Dover became a garrison town during these wars, and tunnels were created to barrack up to 2000 troops. During the Second World War a military command centre and underground hospital were built into more extensive tunnel workings. In May 1940, Admiral Sir Bertram Ramsey directed the evacuation of French and British soldiers from Dunkirk, code-named Operation Dynamo, from his headquarters in the cliff tunnels. Later the tunnels were to be used as a shelter for the Regional Seats of Government in the event of a nuclear attack. I would recommend a tour around these tunnels! After three days in Dover, Alan was itching to move on; not surprising since we should have been down in the Scillies by now. With a cautious ear to the varied weather reports, at 19:30 we intrepidly edged out of the calm waters inside the harbour into the turbulent seas. Wow, those seas were rougher now than when we arrived. No wonder there were no other small boats to be seen out here. Even the Dover dredger, having ventured out to dump a load of spoil, was soon retreating into safety. After a rough night's sailing we were off Beachy Head by 06:00, and eventually took shelter in Brighton marina. The facilities here were superlative; the marina is a leisure village in itself, with cinema, casino, bowling alley, a multitude of restaurants and bars. We put aside our Puritanical life of ship's biscuits for once and let our hair down with a trip to the cinema and a pleasant Chinese meal. Our two days in Brighton were not all fun though. Alan was hoisted up the main mast to try and repair the anemometer. It was a bitterly cold, wet day, and after about three hours the poor lad came down frozen. I can't remember exactly why but great difficulty was had hoisting Alan up the mast. Two winch handles were snapped in the process! We also had problems below decks. Periodically, Kiitaja's alternator would stop charging due to the fan belt slipping. So, periodically, we would take up the floors to access the engine and tighten the belt. By now, we had abandoned all hope of getting back on track to our original plan, and options were being discussed. The forecast was for gradually decreasing winds over the next few days, with the Inshore Forecast for Force 4-5 decreasing, with slight or moderate sea state. Can these guys ever get it right? We decided to make a break for it and head west along the south coast to see how far we could get. With this in mind, we slipped out of Brighton at 09:00 the following morning. This was the crossing point of the trip. It was decided that the Isle of Wight was as far as we were going to travel west. So much time had been lost taking shelter at harbours along the way and making repairs that Miriam had to change all her plans and would only be able to spend a day here before heading back up to Essex via land. 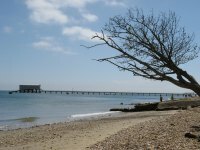 Seeing that there was green and pleasant land surrounding Bembridge, Miriam and I decided to do some walking. Our aim was to climb to the high point overlooking Bembridge where the Lord Yarborough Monument stood. 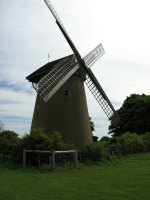 This took us up through the village, reputed to be the largest in the country, and past Bembridge windmill. This is the only windmill left on the island, built c.1700 and still with its original wooden machinery. The story of the man the monument is dedicated to is very interesting. Lord Yarborough's summer residence was Appledurcombe, and, after his family, his first love was the sea. Lord Yarborough's most famous ship was the 'Falcon', a full-rigged ship reported to look like a twenty gun ship-of-war, which was launched in June 1826. Discipline was very strict and ran on Royal Navy lines; he even got his crew to sign a paper volunteering to be flogged if the need arose! They were paid an extra shilling a week for agreeing, although by all accounts, due to Lord Yarborough's character it is unlikely that this ever took place. From the monument, a superb view can be taken in across Bembridge marina, St Helens and the Solent to Portsmouth. The route back via Bembridge airport was scenic. Miriam took the opportunity to pass on some of her professional knowledge on trees to me, and described in great detail the structure of trees, and how it can be ascertained whether a tree was safe or in imminent danger of collapsing. Indeed she was quoting the work of a German expert who had written a thesis describing the mechanics and mathematics behind such studies. I was impressed. 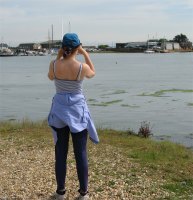 As it turned out, she was intending to spend time in the vicinity in the near future evaluating all the trees on the flight path into Bembridge airport. Passing back through the village, we noticed a concert was to be held in the church in the evening; Vivaldi Gloria and Bach. Since Alan is very much into music of all genres, we decided to take him along to this, and he thoroughly enjoyed it. We wound up the evening by taking part in a pub quiz; we didn't star in this. The following day we secured all the planks on the ships pulpit. The time had also come for Miriam to jump ship. It was a shame, she was good company and a source of inspiration in cooking and Scrabble exercises. She was also leaving at a time when the winds were starting to improve - slightly. I took the opportunity to do some more exploring, and succeeded in dragging Alan out to St Helens for a drink in the afternoon, and we spoiled ourselves that evening by having a meal at the marina club house. The next day I had an enjoyable walk along the coast to Ryde in glorious sunshine; the experience of rough seas seemed so far away. During my return, I got a call from Alan; the marina was filling up rapidly with serious rafting of craft taking place to accommodate the large number of vessels. Apparently they have rafted up to seven vessels deep at times. We had to get out quickly before we were trapped in. When I got back there was by now a raft in front and another behind us. Getting out in the strong tide with a Force 6 pushing us onto the pontoon was going to be tricky, and crews from the rafts before and aft of us were getting paranoid that we may damage their craft in the escape attempt. 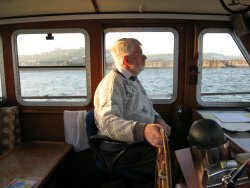 Fortunately Alan is an experienced skipper and using his version of a Highwayman's hitch on a line to midships, got us out without a scrape. The onlooking sailing fraternity were gob smacked at how we managed this. We spent the night anchored outside Bembridge happily in calmer seas. The following day we leisurely watched a dinghy race deciding what to do next. 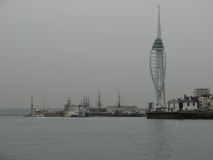 A plan was hatched to sail round the Isle of Wight and drop me off at Gosport; I needed to get back for my Brussels trip. 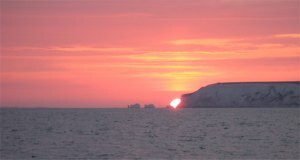 We picked up a little wind allowing a pleasant sail for a while before it dropped, necessitating engine power, and almost reached the Needles by sunset. Continuing in the dark, we rounded the Needles, and headed up the Solent to Gosport, dropping anchor in the early hours of the morning. 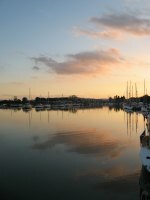 At dawn we headed into Haslar marina, where I jumped ship, and bade farewell to Alan, wishing him a safe and speedy journey back home. Alan does not mind solitary sailing, indeed he gets a certain amount of pleasure from it, but I feel it must take its toll on the longer stretches. Despite all the vagaries of the weather and complete destruction of the original plan, this was a most enjoyable and memorable trip. The company was congenial, and like most of Alan's trips, peppered with a variety of hazards, hardships, surprises and most importantly, fun. I get a lot of pleasure from these sailing adventures; long may they continue.